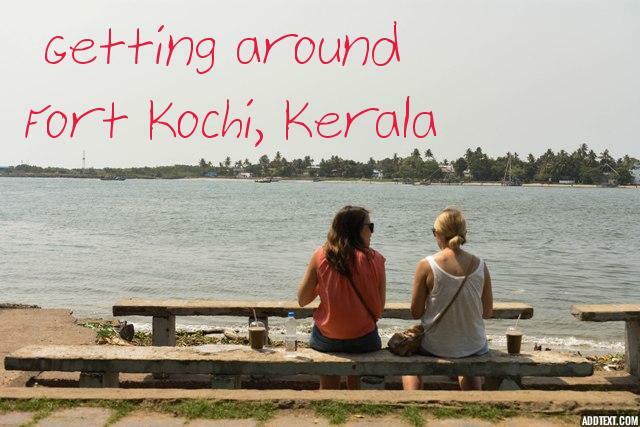 So packing up your bags to venture out Fort Kochi/Cochin ?? Let me take you through a short list of what to see around in this beautiful place in Ernakulam district of Kerala, which I would like to refer as little Goa. As mentioned in earlier posts about Cochin, the Queen of Arabian Sea, here is where I was born and brought up. Whenever I visit back my place, I will make sure to visit the places where you can enjoy horizon at an infinite distance with the calming sound of waves which is missing in Hyderabad where I currently live in. 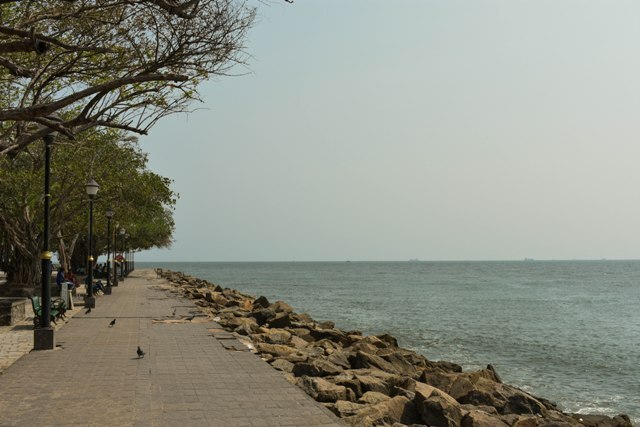 Here is a short list of must see places which you should not miss while you are in Fort Kochi..
Hope you read how to reach Fort Kochi from the mainland Kochi in my earlier post..
As you step out from the boat and head towards the beach through the Calvathy road to the right from Ferry, this will be the first thing to see after a 15 minute walk(around 1 KM). 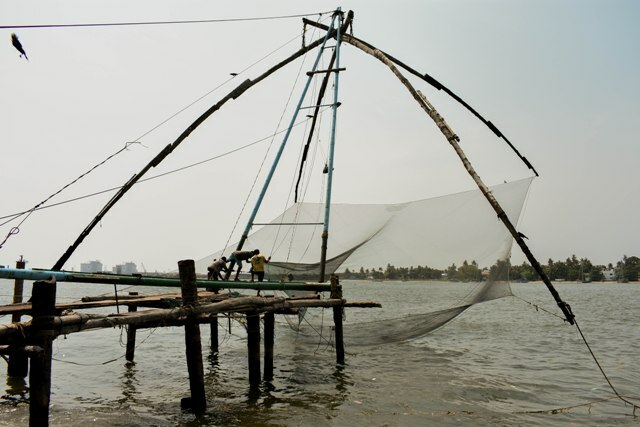 Chinese fishing nets which are called Cheenavala colloquially are huge nets for catching fish suspended in water and raised eventually which are operated manually. Sunsets with Chinese nets have become a landmark to the Kochi and favourite subject for shutterbugs. 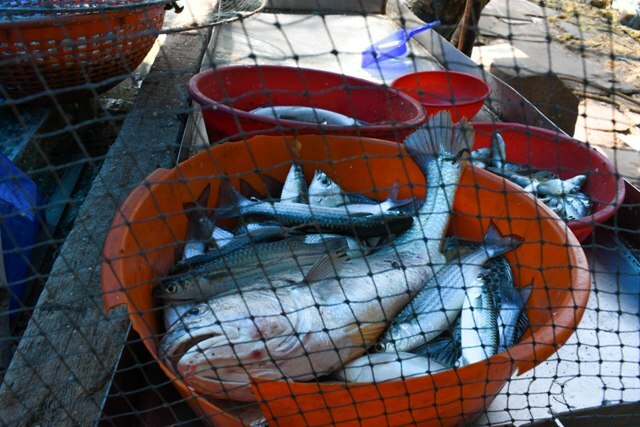 Enjoy watching the live fish caught by fishermen as the nets are slowly raised in. 2. Don't miss out tasting the fresh live seafish. So watched enough the live fish caught using cheenavala?? Now buy some from a wide range like tiger prawns, crabs, the Kerala special Pearl spot etc and get it cooked in the beach itself. 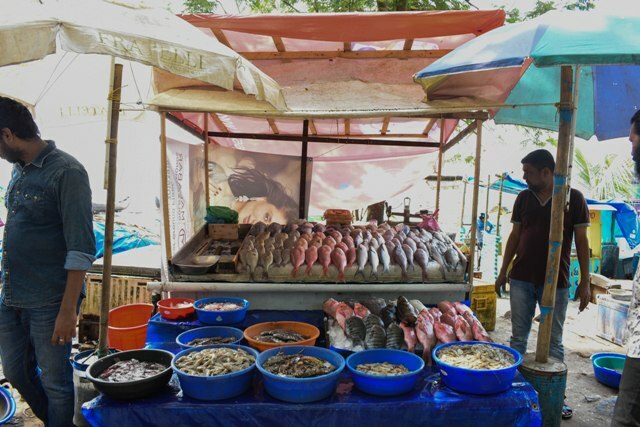 There are small shacks setted up along the beach which cooks and serves the fish you have choosen from. So if you are a seafood lover, enjoy some, viewing the beach and lingering the Kerala spicy fishfood. Tummy full after eating deliciously prepared sea fish?? Now let's go for a walk on the beach watching the beautiful shades of grey and the soothing wave sound. While walking to the other end of the beach, watch out for red huge structures as seen below..
Did you understand what it is?? The inscription on it says they are the steam boilers of cranes used in cochin dry docks. Still didn't get it?? Oh then we are same😒. As you move forward, the beach road ends and reaches the restricted area of coast guard. 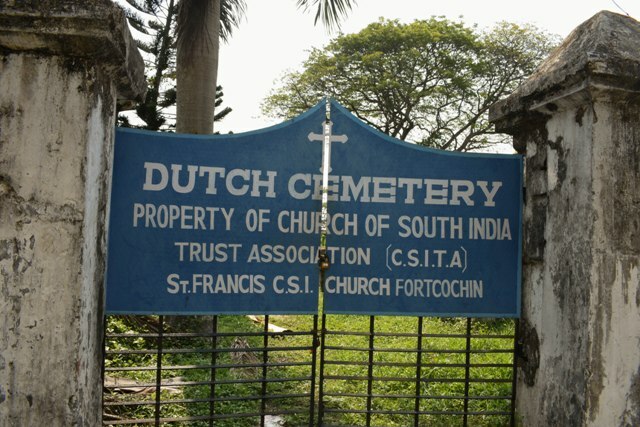 Taking a left from there takes you to the oldest European cemetery in India where the great Dutch war heroes are resting down. It will be always locked up, So peek in through the gates to have a look at the green graveyard. 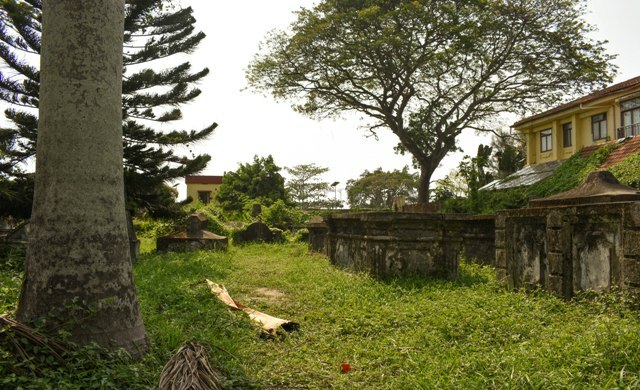 You can read more history about the Dutch Cemetery in the article published in The Hindu newspaper here. 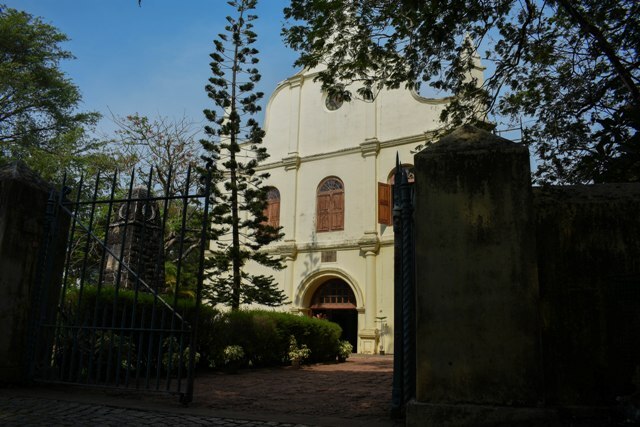 A series of lefts and rights for about 5 minute by foot from the Dutch cemetery, takes you to the oldest European church in India where Vasco Da Gama, the explorer was buried in 1524. Though the remains were moved from here to Lisbon later, tombstone still remains. Photography inside the church is prohibited. If the church appeared dull and Vasco Da Gama tomb didn't interest you, look above(No am not kidding). 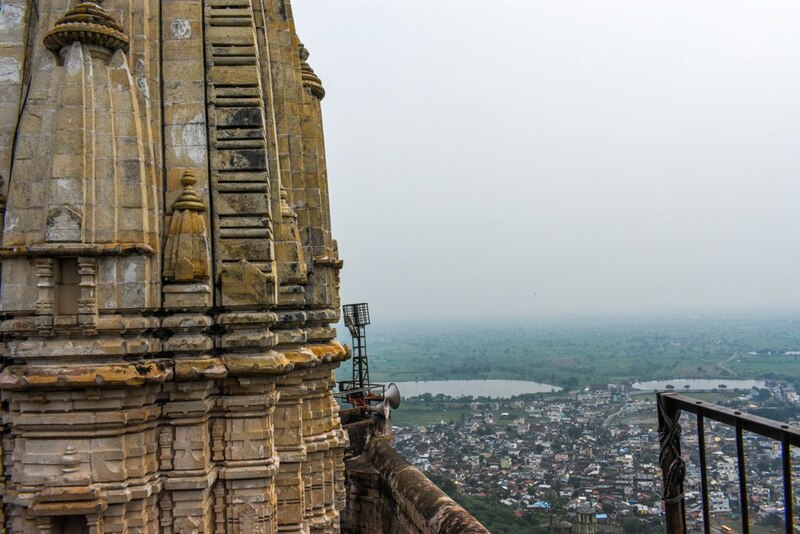 You will see curtain like clothes hanged from wooden structures held by ropes which were once manually operated fans. 6. Anyone interested for a little shopping?? Enough with the history, now lets do some shopping. 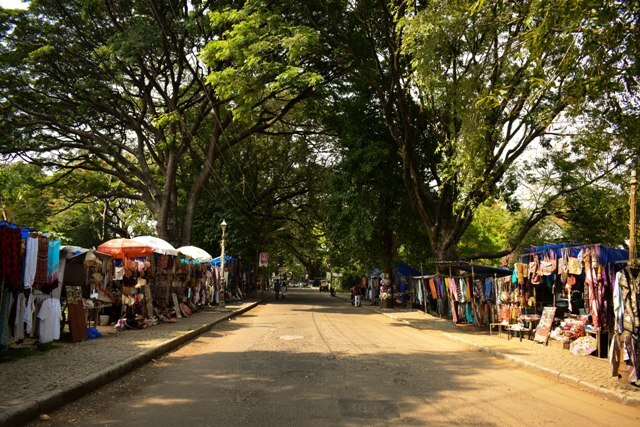 As you come out of the church and walk forward, you will reach a small shopping area. Buy some bohemian dresses or collect some mementos for your loved ones made of seashells. And there are beautiful European model streets selling antiques, handicrafts, dresses, spices. Also watch out for mind blowing graffiti on the walls. Fort Kochi is best explored by foot. There are chances you may get lost on the streets. But ask anyone for the route back if you get confused with the roads, they will be of help for sure with a wide smile. Also you can rent a bicycle if you hate walking. Or you can hire a tuk-tuk (auto-rikshaw) for touring around. There are innumerable cosy cafes around which is very inviting with all the beautifully decorated interiors as well as exteriors. Have a cup of coffee admiring the pretty streets if you are tired trotting around. 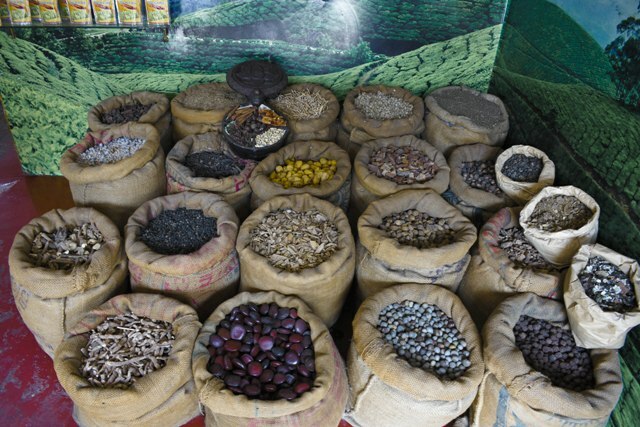 Did you grab some quality spices and dry fruits to take home with you?? Even the explorer Vasco Da Gama sailed all the way from Europe through the Atlantic, Indian Oceans in search of spices here.. 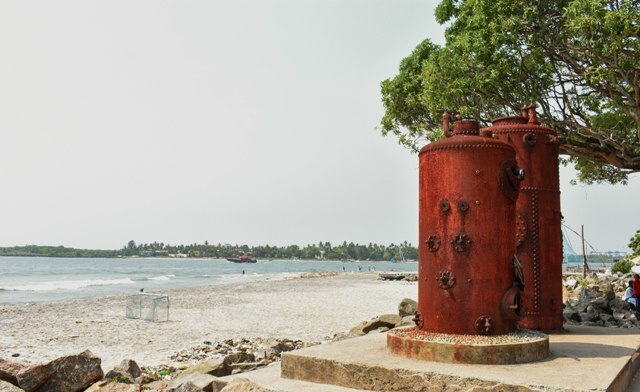 I have only penned down what to see in and around the Fort Kochi beach. 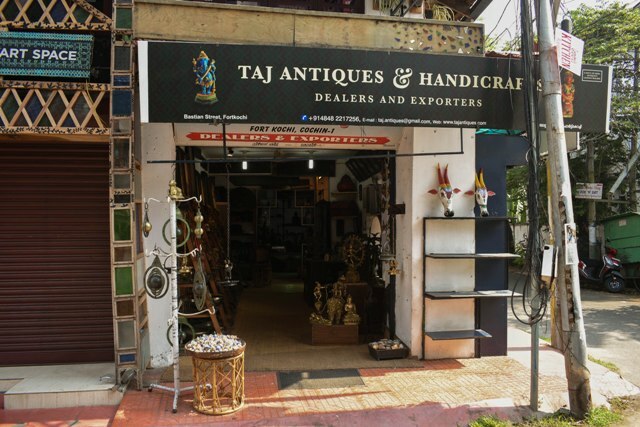 Mattancherry, which is a twin town of Fort Kochi is at a distance of nearly 3 Kms from FortKochi Ferry where the famous Jewish synagogue and spice market is. But that's for another blog, when I visit next time to home. It took around 3 hours to explore and stroll around the streets by foot. But still we couldn't visit some of the places. Santa Cruz Cathedral Basilica which can be reached in 5 minutes walk from St. Francis Church. Kathakali Performance at Cochin Cultural Centre, which is just opposite to the Brunton Boatyard. Show starts at 5 PM. Reach there by 4 PM to see the artists wearing the elaborate and colourful makeup. Entry to the same can be done by a ticket pricing of Rs.400 per head. Old-Jail complex which is at a 3 minute walk from Fort Kochi - Vypeen Ferry Terminal. Indo portuguese museum 6 minute from Dutch cemetery and Maritime museum 8 minute walk from Indo-Portuguese museum. Did I mention, this is one of the venue for Kochi Muziris Biennale, the International contemporary art exhibition. If you are an art freak this is a must visit exhibition. And its the most happening place in Kochi for New year celebrations, conducting Cochin Carnival which starts by December and celebrations lasting until January 1st. Have you ever roamed around your place where you belongs to after some time gap?? In this visit for me each and everything was feeling different. The roads, the people, the food.. This was the time when I looked at my city from the eyes of a tourist. If I miss out any place, please mention in the below comment box. Jim Corbett Ramnagar covers an area of about 520 square kilometers, comprising of hills, marshy land, large lake, riverine belts, and grasslands. Jim Corbett National Park allows overnight stays to its visitors. To move around within the National Park for watching nature and wildlife, take on a Jeep Safari or an Elephant Safari.